Vieux Carré Scampi with Quinoa, Thyme for Cooking easy gourmet dinner. Both the quinoa and Brussels sprouts cook in the amount of time the shrimp bake. This is based on one of a 'box' of recipes I got years ago. It's a bit heavy on the butter, which makes it ideal for serving over rice or pasta... or Quinoa. Divide into 2 buttered, shallow, individual baking dishes or 1 larger one, arranging nicely. 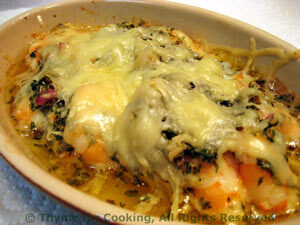 Divide garlic, shallots, parsley and sprinkle over shrimp. Drizzle with lemon juice, dot with remaining butter and sprinkle the cheese over all. Bake at 375F (190C) for 15 - 20 minutes, until hot, bubbly and shrimp are done. Time varies depending on size of shrimp. Serve. Note: I put the small dishes on a baking sheet for easier handling. I love the nutty flavor of quinoa, plus the fact that it's an 'almost perfect' food, and it's easy! It can be cooked a bit ahead, then removed from heat and let sit, covered for 10 - 20 minutes. When ready to serve, uncover, stir in the herbs and spoon into a pretty bowl. Reduce heat and simmer until done, about 15 minutes (or whatever your package says). When quinoa is done, uncover, fluff and serve. 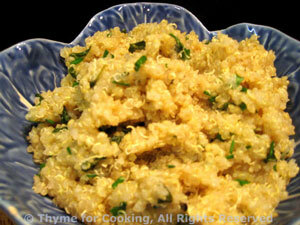 Note: Add the dried herbs at the beginning, with the quinoa and stock; add fresh herbs at the end. A bit of Prosciutto can liven up any vegetable but works particularly well with the cruciferous family. 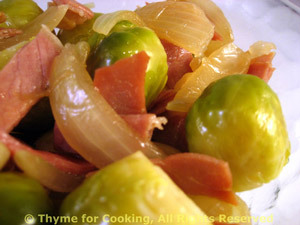 Brussels sprouts are not bitter if not overcooked. Allow these to stay just on the crispy side - cooked but not overcooked! Slice off stem end of sprouts and remove any wilted or damaged leaves. Heat oil in small nonstick skillet over medium heat. Add shallots, Prosciutto and sauté until shallots are transparent and Prosciutto is starting to crisp. Add sprouts, chicken stock, cover and simmer over medium heat until sprouts are just barely tender, 10 - 15 minutes, depending on size. Check by piercing with a knife - it should go in fairly easily but with a little resistance. Try not to overcook or they tend to get bitter. Remove cover and cook off any remaining liquid. Serve.